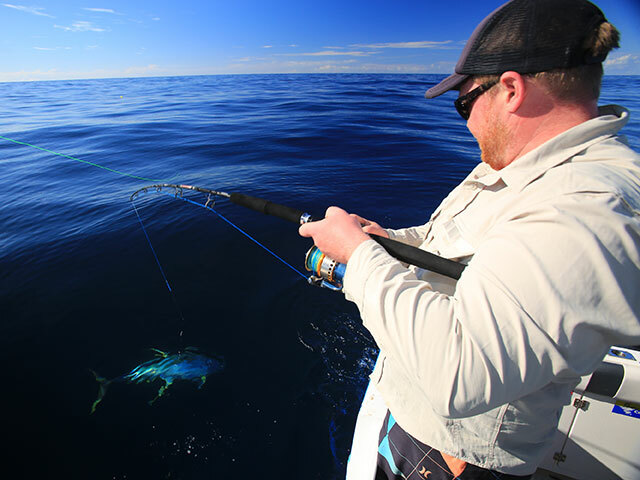 Follow these pro fishing tips on how to chunk for tuna in Australia..
Chunking creates a tantalizing trail of breadcrumbs that draws tuna up from the depths and into your spread. All Photos by Al MCGlashan. Use chunks that are large enough to sink down near the thermocline where tuna often lurk. The FishTrack SST chart shows temperature breaks at the southern end of the East Australian Current off New South Wales. Areas of slack current will often contain tuna. When you arrive at a promising spot, scan the area for birds and surface activity. Start sending out chunks as soon as you see the action. If the fish seem leader-shy, you may need to downsize your tackle. Keep experimenting with different baits and line weights until you get bit! Although chunking will often bring them to the surface, tuna can lurk throughout the water column. Send out a number of baits at different depths to find the fish. While some anglers disagree on which moon phase is most productive, Al finds that the hour right before sunset if a hot time for big fish. 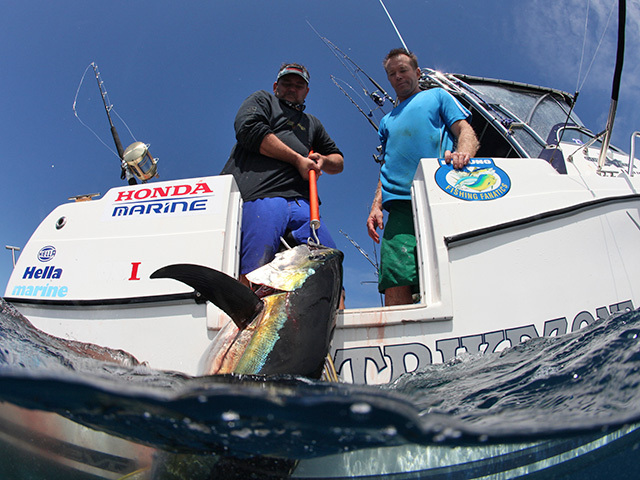 When it comes to catching big tuna, chunking is undeniably effective. Known locally in Australia as cubing, this technique consists of leaving a bait trail to draw tuna up out of the depths and within reach. The keys to successful chunking include picking the right spot to set up your trail, fishing a variety of baits and fine-tuning your gear to match the whims of finicky tuna. Fishing in the right spot means understanding the currents. 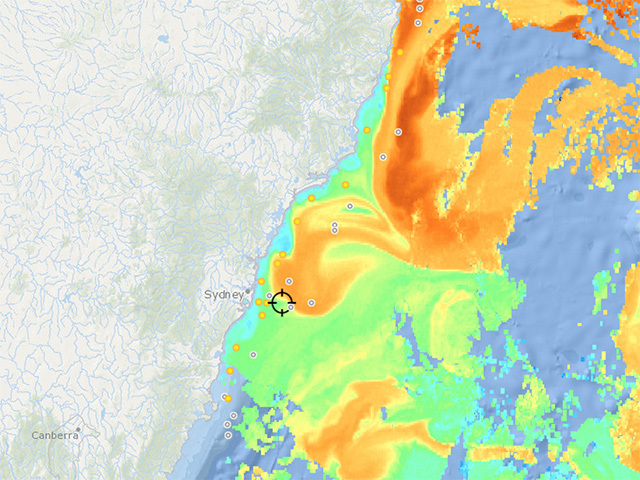 Every season the East Australian Current (EAC) pushes warm tropical water south, and tuna and other pelagics ride it like a highway to feed in the fertile waters off southern New South Wales. The fish ride the main current down the coast, but often jump out of the fast lane looking for slower currents in which to feed. 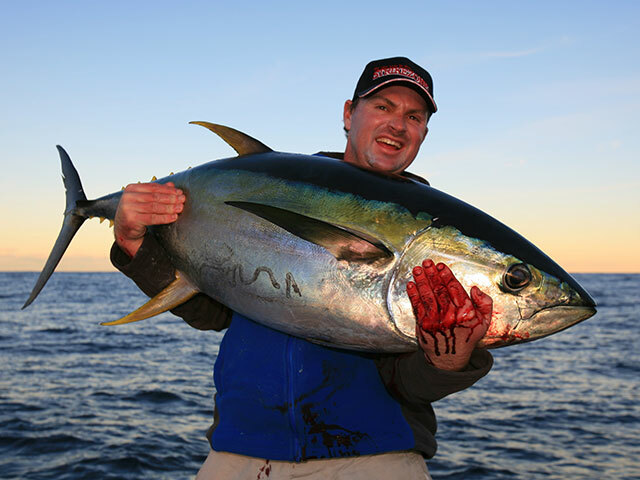 This slack area at the bottom of the EAC is known as the Tasman Front, and it is a rich feeding ground -- the biggest yellowfin and bluefin tuna caught in Australia have all been taken in this area. Conditions change, and the only reliable way to find these hot spots before you leave the dock is with services like FishTrack that offer current and sea surface temperature (SST) charts, along with chlorophyll charts that show where the richer plankton filled waters are and highlight the all-important edges along cleaner blue water. Interpreting the charts is more complex than some anglers think, and many chase the hottest water they can find. In reality the fish are often found in the cooler water, such as back eddies that shoot off the main current. In looking back through my logs I find a few patterns: A temperature range of 18 to 21 degrees C has always been the most consistent yellowfin water for me; tuna don’t like a lot of current, but still prefer clean blue water; and breaks can be productive so long as they are not too distinct -- subtle changes in temperature are ideal. But more than anything there needs to be bait present – no food, no tuna. While the charts will get you into the right area, they don’t show real-time conditions on the water. You’ll need to refine your search by reading the signs. Check for subtle variations in current speed and water color. Birds and other marine life like sunfish that can often point you towards the tuna. 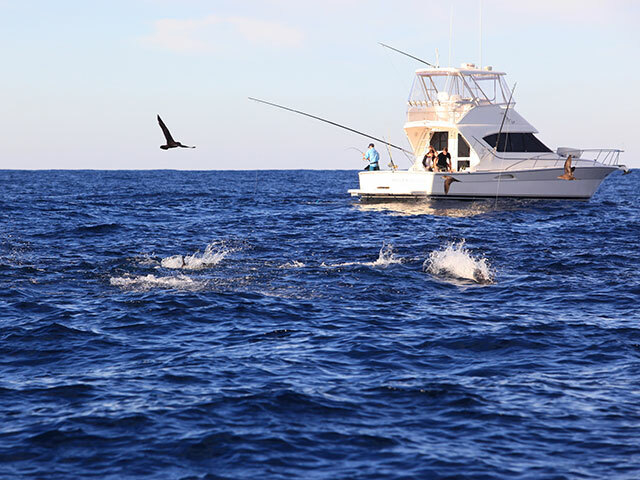 Obviously hook-ups or surface-feeding tuna will indicate go-time, so always keep your eyes on the water. While trolling you should always have a pile of cubes ready to go. As soon as the bite comes, start tossing them over the side in an effort to whip the school up into a feeding frenzy. When preparing your pilchards, don’t chop the chunks up too small. Bait isn’t cheap, but you’ll want the cubes to be chunky enough to sink down through the water column. Tuna spend a lot of time down near the thermocline, and heavier chunks will sink more quickly into the zone while smaller ones are carried away with the current. When fishing on Strikezone, I like to have two anglers working the lines simultaneously, while someone else keeps the cube trail running. One angler, running a 100-pound trace and a whole pilchard, strips it right back down the trail 100 meters back or more, depending on the conditions. The second angler, who is running a 60- to 80-pound trace, only strips a short distance down the trail. If we start catching tuna on the light trace then we can assume they are shying away from the heavier line and immediately downsize our tackle. When fine-tuning your tackle, keep in mind that you shouldn’t run light leaders unless absolutely necessary. When you hook that tuna of a lifetime, you don’t want to start off with an unnecessary handicap like a too-light leader. When it comes to rigging up cubes, smaller 6/0 to 8/0 hooks work great. They are easily hidden and make your offering look more natural as it drifts down the bait trail to draw a bite. But tuna can be finicky, so you should always have a couple of live baits in the water as well. Suspend one livey under balloon so that it sits relatively shallow, and another rigged with a small sinker so it holds mid-water, preferably down near the thermocline. 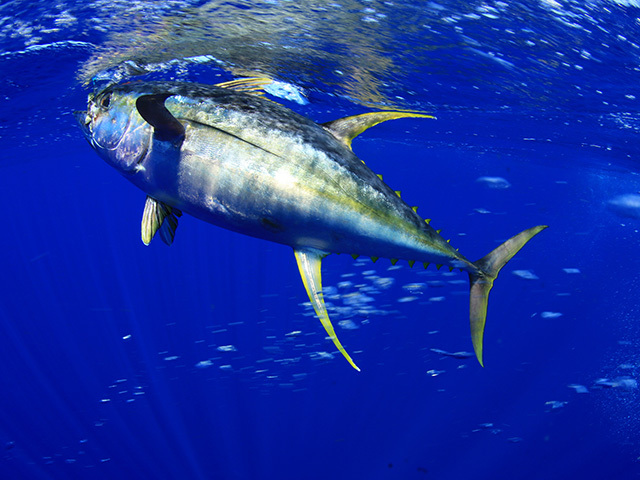 If conditions allow, a third bait way down deep will maximize your chances of a bite from a bigeye or even a swordfish. If you get a few hits but fail to hook up, or if the live baits are nervous, there are two tricks I employ. One is to rig a chunk on a really light leader (50 to 60 pounds) with a small 4/0 hook and send that down the trail. You can also free spool a heavy metal jig. Once the jig is right down along the trail, crank it back as fast as possible. Even if you don’t hook up, there is still a very good chance the fish will follow it back to the boat. This trick also works when you are marking fish deep on the sounder. There has always been a lot of speculation over when the tuna bite best and everyone seems to have their own theories. According to Japanese longline records, the highest catch rates were always around the new moon on both Australian coasts. Many recreational anglers agree, but a few still insist that the full moon offers the better fishing. Tides are another area of contention. One sure bet for me is that last hour of daylight. 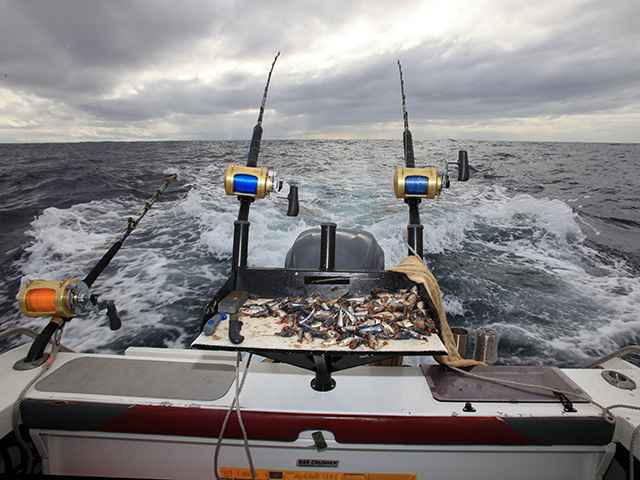 One season I caught 70-odd tuna in a three-week period off Sydney, and nearly all those fish bit right before sunset. So be prepared, study the charts and remember that it may pay to show up late!